And I must follow, if I can.’ by JRRTolkein, from Guide to Using a Garmin. Its 04.35 on a drizzly Saturday in the middle of Llandrindod Wells and an eclectic group of riders slowly assemble from the deserted streets, all collecting brevet cards in anticipation of one hell of a ride. This is the start of This is not a Tour 600km-in the spirit of Mike Hall. There is a start, a finish and inbetween an audacious route of Wales best on and off road tracks, oh and did I mention 10000m+ of climbing. No drop bags, no organised meal or sleep stops, no broom wagon, this is an Audax equivalent of free climbing. I had ridden a handful 300km events in the past so this was way out of my comfort zone, with the added bonus of never having ridden through the night thrown in for good measure. It promised to be emotional. Looking at my bike and gear it was apparent I had packed for the TCR rather than 600kms, my boy scout always be prepared mindset had gotten the better of me, I even had a head net to ward off midges—well it could have been needed. The downside of all this forward planning was apparent as soon as the group hit the first climb at Builth Wells and natural selection put me in my place near the derriere du peleton. Passing a sign of 25% gradient cemented my position. Despite almost missing a sharp Lt bend on a fast downhill section I eventually arrived at the old mountain road to Tregaron. Despite climbing it many times , the Devils Staircase and subsequent climbs always demand your best effort, anything less and you walk. After a brief refuelling in Tregaron it was off to the first offroad section around Claerwen reservoir and our only ford crossing. Despite recent rain the ford was rideable, so pleased to keep the feet dry. The rocky trail made progress slow and a little uncomfortable but thankfully escaped any sidewall cuts/punctures. Arriving back onto tarmac was sublime. 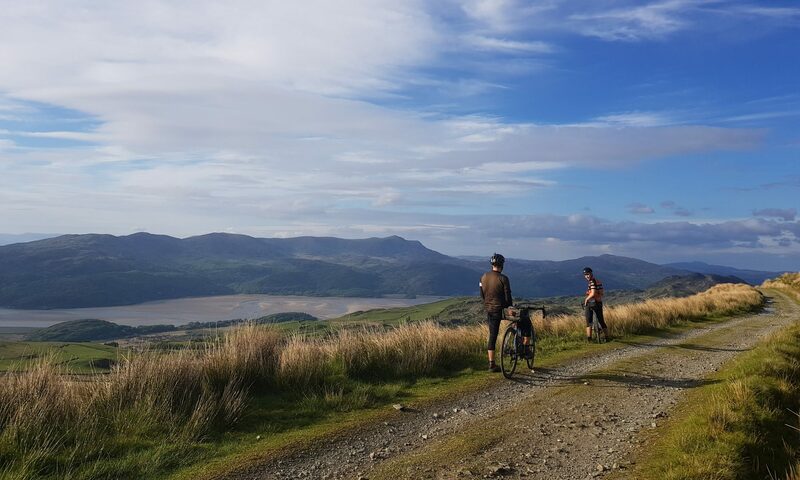 The next offroad trail was by contrast a proper smooth gravel ride with amazing views of the Elan valley reservoirs. This merely lulled us into a false sense of security as the following offroad section after cresting the upper end of the valley, was probably the most technically demanding riding I have ever done. The tarmac had worn away to the point where only the centre 60cms existed, with deep drop offs on either side. And it hit 20%. Quite a balancing act and by now the sun was blazing down, sweat pouring off me as I toiled to the top. After that a longer refuelling in LLanidloes at 152km then off through the Hafren Forest and the mountain road to Machynlleth with a fast descent as a reward for all the hard climbing. Stopping for mainly a liquid refuelling, chocolate milk which became a staple drink of choice on this ride, bidons full of cool water, then onto the Dovey Estuary and over the hills to Tywyn on the coast. A quick but vital reapplication of sunscreen was in order before tackling the climb to the last section of offroad. Looking across from the high ridge towards Barmouth was a standout moment which is more than can be said for the descent. One of the best MTB descents in Wales I was informed, only problem was I didn’t have a FS MTB. Bouncing downhill, desperately trying to avoid the largest of the rocks, I had to admit defeat several times to stop to regain my balance. On the plus side there was cake at the checkpoint at the bottom, thank you. Into Dolgellau, for a longer stop for pasta salad, fruit, more chocolate milk and extra water. By my reckoning it was 150kms to the Shell garage at Betws y coed and all the shops were closing now so I had to pack enough supplies to see me through. I did regret eating so much as I slogged up the climb out of Dolgellau but managed to keep my bottom gear turning over slowly. Now headed towards the one climb I was not relishing, Bwylch y groes, a notorious monster of a climb and now I had a fully loaded bike to haul up it. From a distance you could see the crash barriers of the really steep top section but the whole climb just looked as if tarmac had thrown onto the sheer mountain side, no forgiving Alpe D’Huez style hairpins on this climb. It was hell and the only time I contemplated bailing by turning Rt near the summit and following the 400 route back. To make matters worse there were 2 riders on the 400 ahead of me which only added to the temptation to switch routes, after all a 400 would still be my longest ever ride. This may sound a little contrived but two thoughts entered my head, ‘what would Mike do?’ and ‘here be dragons’ a reference to warnings of unexplored territories on medieval maps, rather appropriate for Wales I thought. That was it , I waved towards the 2 riders now stopped on the other track, heard a shout of ‘Good Luck’ and it was off to the summit and on to Snowdonia. Looking at the long descent I knew this way lay adventure and that was why I was here. Allons y. Feeling a sense of calm now I had commited myself fully to the 600 route the next goal was to get over the last mountain before nightfall, it was 7.40pm. Climbing the gated road was tricky at times due to the setting sun being directly into my eyes and I was forced to ride with one hand shielding my face from the light. I took a comfort break just after one gate when from nowhere a rider appeared coming the other way. He had obviously met some other 600 riders as he knew what I was doing and wished me well. Small gestures of encouragement mean a lot and I resumed climbing with a renewed purpose. The route seemed to last forever and it was getting dark when I finally reached the main road. At least I had avoided the woolly ninja assassins which would feint a move one way then dart back across the road infront of you. The only place for them is on a plate with mint sauce and new potatoes not on a narrow, technical descent. At the main road I put on my warm gear as the temperature had dropped noticeably. Within seconds I was enveloped by a cloud of biting midges, a particular dislike of mine. Lights on and then I pedalled hard to rid myself of the little pests. Thankfully the road was smooth, then gently downhill and a relief to be able to make up some time at last. Note to self, in future do not set Av speed as main reading on the Garmin, it was soul destroying to see it slowly decay from 21 to 19, then 17 kph. The main road to Maentwrog was also a good learning experience for riding with lights, which were brilliant in all meanings of the word. It also marked the halfway point after 17hours. Now I knew this was doable, no time pressure and I actually began to enjoy myself. Riding in the dark was a revelation. Gone were the distracting sights and feelings of being alone in a vast wilderness. My world had shrunk to a small circular area illuminated by my headlight, nothing else existed. No longer despairing at looking at the long climb ahead, all I now had to do was climb the next few metres that were visible to me. Simple. In my compact world I was king and I was on the ride of my life. Some time before I had promised myself a cold drink at a pub as a reward but time was running out. Arriving into Beddgelert I staggered into the bar 4 mins before last orders and was able to sit down with a well earned pint of orange juice and lemonade and a packet of scampi fries. The barman said he couldn’t ride 3 miles let alone300+ and I well believed him! Pushing on into the blackness of Snowdonia I eventually found the turn towards LLanberis and some proper gravel riding thanks to a generous layer of new chippings on the road. This marked the most northerly point of the ride and Caenarfon looked a picture brightly lit in the night. Riding through Llanberis I foolishly played the game of find a good spot to sleep which had the unwanted effect of bringing on a sense of tiredness. Thankfully, having passed all the people bedding down for the night in cars and vans parked by the roadside, another pair of riders caught me near the summit of Llanberis Pass which woke me up. A brief stop at the top for a bite to eat then I chased after the two red lights ahead of me. The extra weight of my gear, a hindrance going up, was a benefit descending and I caught them just after Capel Curig. I then rode with Matt and James to the oasis that was the 24hr Shell garage at the farside of Betsw y coed. Coffee and a BLT never tasted so good. We spent a little longer than normal there due to the fact that every item of our order was retrieved from the shop one at a time by a very patient man at the kiosk. After eating I applied much needed and long overdue chamois cream completely forgetting the multitude of CCTV cameras present- a video coming to YouTube soon no doubt. Despite the enormity of the ride up until now I was feeling really good and was raring to get going again. Watching the red tail lights going further away as we climbed out along the A5 was a little sad but I had to ride at my speed but it was sometime before they completely disappeared and I was back in my world. I enjoyed riding the small lanes in the dark, passing sleeping farms, listening to owls hooting and finally seeing the moon break through the mist. Back onto the B roads and downhill to Bala, very still at 0400 on a Sunday. Now 408km ridden and no signs of problems. The climb up Hinant Pass was breathtaking although in parts it resembled a miniature Bwlch y Groes. Descending to Lake Vyrnwy I joined a rider who had stopped for a short sleep and together we motored around the flat lakeside until we actually caught sight of the red tail lights I had last seen on the A5. A hungry group of 5 riders arrived at the village shop which had opened all night just for our event. Chapeau. They were even offering cooked breakfasts which my fellow riders ordered but I stayed with chocolate milk and a sandwich before leaving while they waited for their meal to cook. My plan had always been to breakfast at McDonalds in Newtown and I was a man on a mission. Unknown to any of us McDonalds was being refurbished!!!!! So I was feeling a little disappointed as I climbed out of town and onto Knighton. I knew Knighton well although the ride down the valley took forever. A late breakfast eaten in the square the sun beaming down and life was good. It was 10.30am. Then began the last big climb of the ride and I couldn’t believe my eyes when I caught up with Matt and James once again. We were all now in a relaxed frame of mind knowing there were less than 80km to go, it was a beautiful day and our stops became more leisurely. The route from Kington , through Hay on Wye to Gladestry wasn’t great, but then it was being compared to just about the best we had ever ridden. An event in Hay just meant traffic++, speeding cars and so I was glad to get back onto the smaller lanes and head towards Llandrindod Wells. We were riding well with Matt pulling us all along until my bottom bracket started making a knocking noise, so I stopped and watched them ride away. Despite adjusting the free play of the crank arms the knocking persisted so I rode slowly back to the finish. So gutted not to be in the group which had helped me so much. Actually remembered to save my ride on the Garmin, total stats were 598km(missed first 5 km before remembering to turn it on!, 10304m ascent, all in 34hours 50 mins. Would I ride it again, not a chance. This was a ride with a purpose above and beyond the mere statistics. It was a first in many ways for me and the weather was amazing so I will quit while I am ahead. Might do the 400km next time though. Postscript: Once back at my hotel, a long shower then set my alarm for a short sleep before eating. I went out like a light. Waking to my alarm I tried to get up but my legs had stiffened. As I lifted my leg I was gripped with severe cramp in the muscles of my inner thigh. Trying to stand up to stretch it only resulted in the other side cramping in sympathy. I hauled myself upright, big mistake because the next thing I felt was a bang to my forehead as I blacked out. Waking on the carpeted floor the cramp had eased but I was aware that my face was in a warm, wet pool of blood. My head had caught the door handle and I now have a 4cm gash on my Rt forehead. Pressure soon staunched the bleeding and some improvised butterfly sutures held it together. The poor young receptionist who cleaned the carpet was concerned at the amount of blood loss, I hadn’t the heart to tell her that I had already mopped most of it up. After eating I limited myself to a pint of cold shandy then much needed sleep. Perhaps one day I may have grandchildren who will ask how I came by the scar on my forehead, then I can tell them of the weekend in June I rode the TINAT600, of adventure, and…a man called Mike. Roadside options, Wellington Rd, layby towards Howey, Pentrosfa, Brynteg, Grosvenor Rd, Western Promenade, Princes Avenue, Park Lane, Cefnllys Lane. Waiting confirmation on school carparks – Llandrindod High, Cefnllys and Trefonnen. Will keep you posted if we hear any more. For parking at Highland Moors, we estimate they will be trying to get in 30 cars, so pls let Sue at Highland Moors know when you arrive and the team will help. If you’re coming at crazy hours, just make your best guess so as not to block others in if possible. They will try and get the those leaving on Monday tucked away to leave room for others who will be coming and going.